What Are Lieutenants in Magic? A rare set of creature cards, lieutenants activate powerful effects— if (and only if) you control your commander. 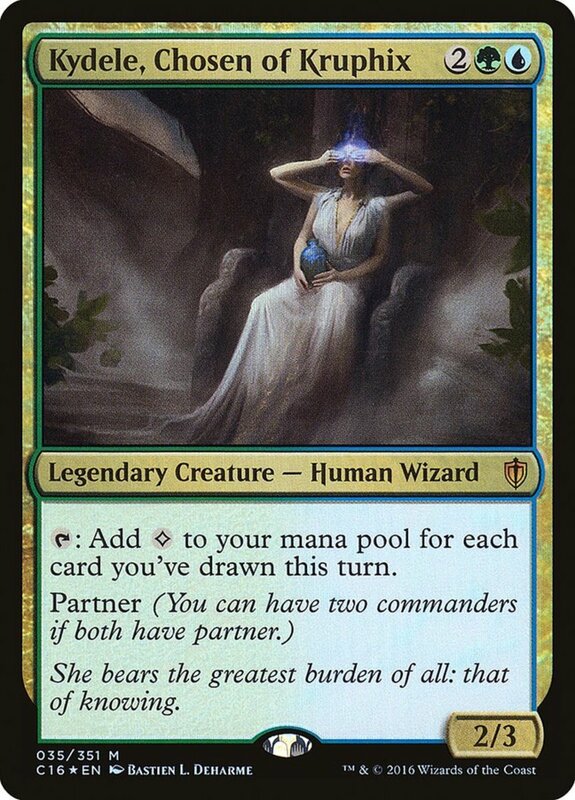 Naturally, to even have a leader, you'll need to be playing EDH format, meaning lieutenants are only really helpful in that mode. 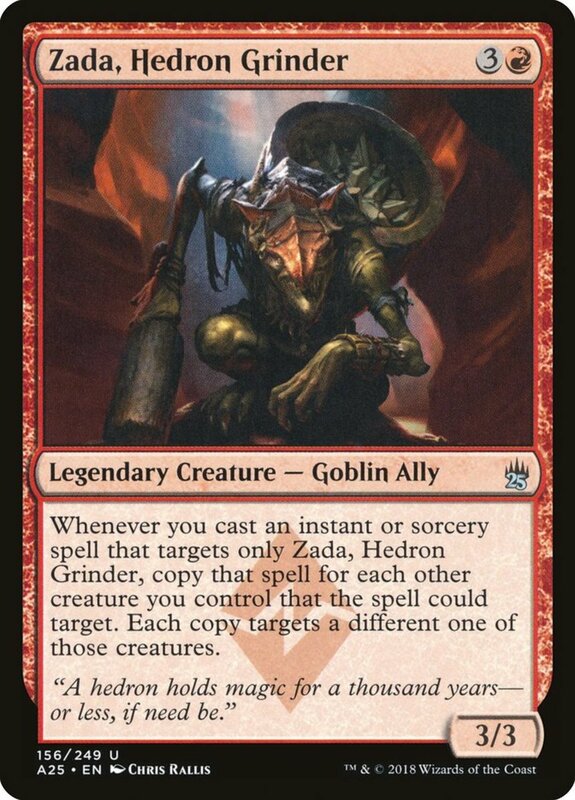 Luckily, it's my favorite format due to its diversified matches (once one card copy per deck), and your second-in-commands make up for their situational abilities with awesome bonuses that often assist your entire army. As of this writing, there's exactly ten lieutenants to choose from, two from each color. But with their varied abilities, which marshals reign supreme? These are the ten strongest lieutenants to support your commanders in Magic: The Gathering! For five mana, 4/4 (four power and four toughness) is a decent unit, and this tortured demon also bears flying, letting it soar over ground-based blockers. 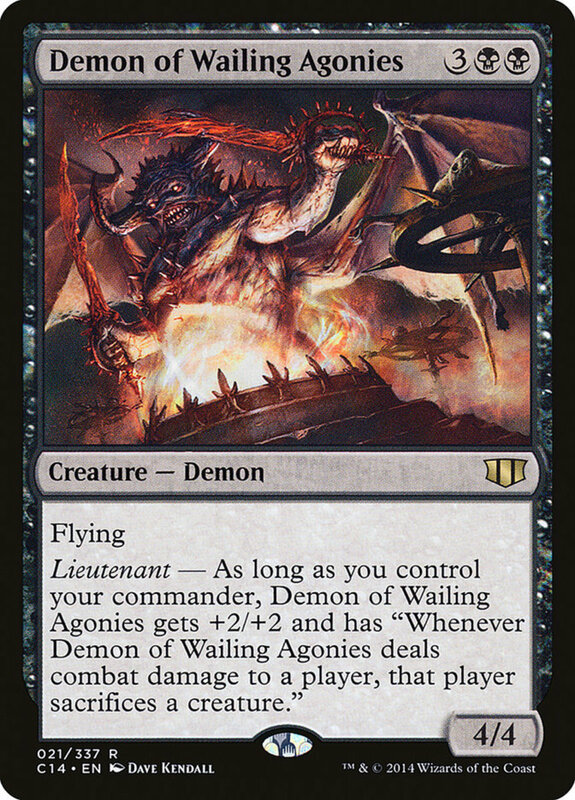 However, like all assistants, Wailing Agonies really shines while you control your commander, at which point it receives an extra +2/+2 for a sweet 6/6 and makes your opponent sacrifice a creature whenever it inflicts combat damage to them. Forced sacrifices are brutal (they circumvent protection and indestructible defenses), but since the trait only activates when you land a direct attack, all your opponent needs to do is block to avoid the penalty. Still, if you can render Agonies unblockable with other effects, you'll have a powerful combo. Like all lieutenants, this dark demon works well alongside indestructible commanders (like the legendary "Athreos, God of Passage") or partner commanders, as it's easier to maintain them on the field and keep your bonuses active. Loyal Subordinate needs just three swamp lands to cast, but this zombie only arrives as a 3/1, making it risky to attack or block since it can't take much punishment. That said, its menace keyword lets it only be blocked by two or more defenders, meaning you can safely swing if your opponent has only a single creature out. 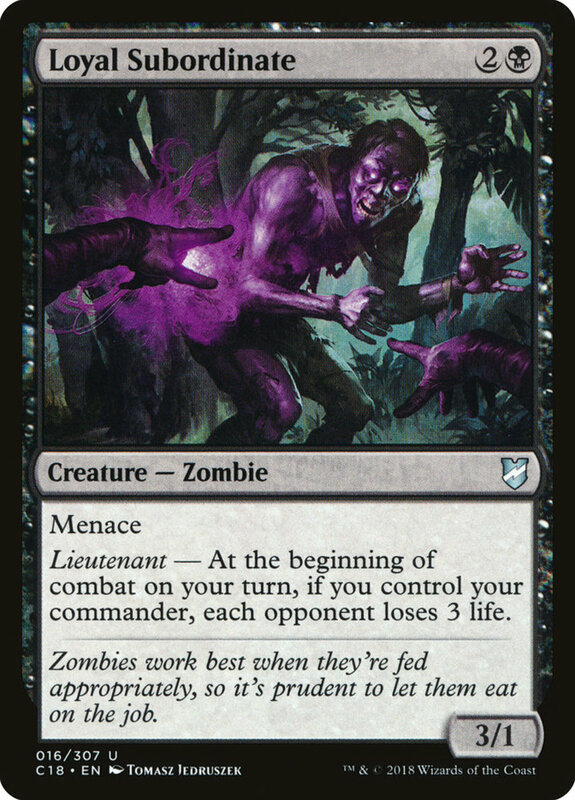 Regardless, Subordinate applies a life-sapping debuff alongside your commander: your opponent(s) lose three life at the start of your combat steps. That's an annoying decrease every turn, and since you'll likely field Subordinate (and your commander) in your turn's first main phase (before combat), you should be able to activate the trait almost immediately. A handy effect, but I wish the drained life points would recover your own health, which would really justify using this glass cannon. While 2/2 isn't exceptional for a three-cost reptile, Loyal Drake also bears flying, excelling in aerial combat. Like Subordinate, its bonus activates at the start of your combat phases, and you can play it early in the match, needing just three blue mana. 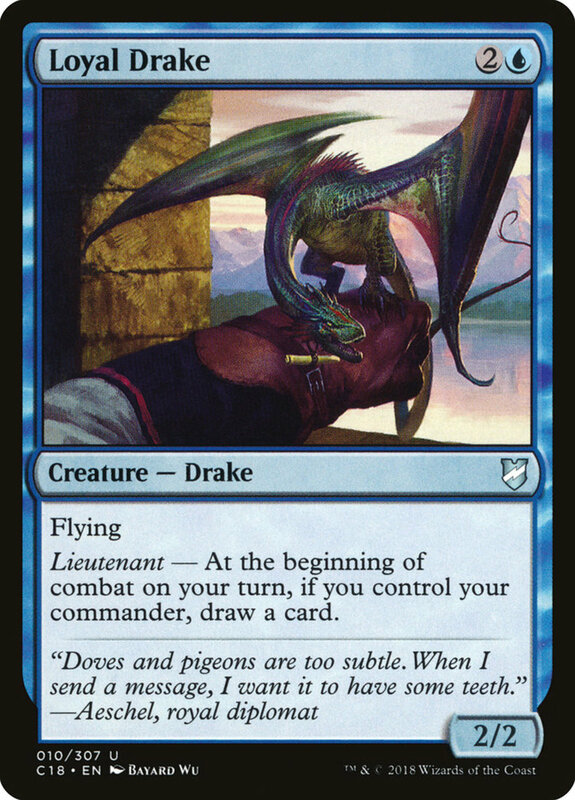 At the start of your combat while you control your commander (you only need one out if you're using two partners), Drake simply draws you a card. Over the course of the game, this can grant some incredible hand advantage, and if your general ever dies or you simply need someone to tank a hit, in the late-game, Drake makes a good throwaway blocker against an incoming threat, capable of defending against both land and sky invaders. 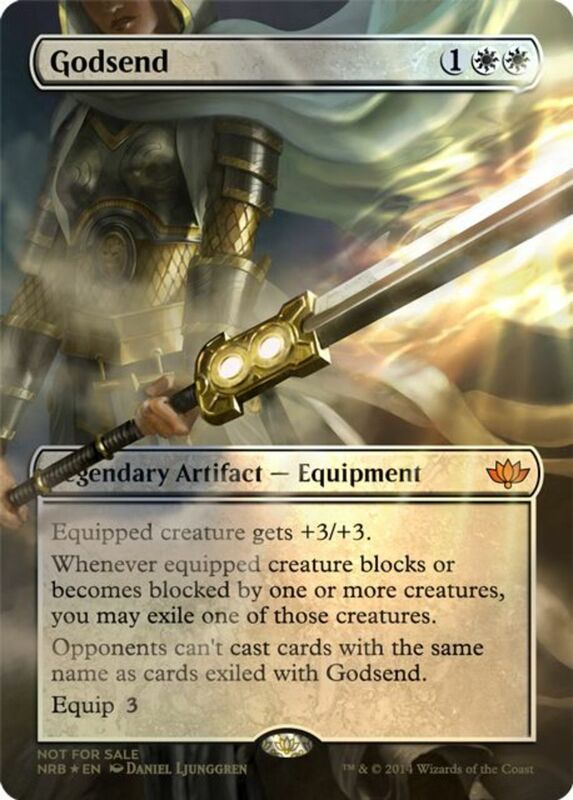 A bit more costly than Subordinate and Drake, but not much as Wailing Agonies, Angelic Field Marshal needs four mana but joins the fray with a respectable 3/3 and flying. As long as you control your commander, this angel receives +2/+2 (for a fierce 5/5), and she'll grant all of your creatures vigilance! Vigilance lets your warriors attack without needing to tap, letting them later block or use their tap effects, a handy boon that not only benefits Field Marshal, but your entire squad. 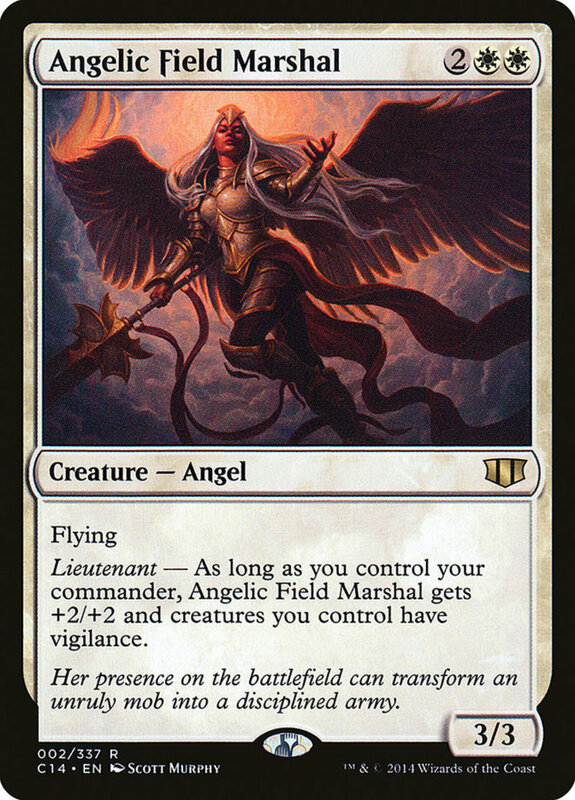 Several of the best white angels, like "Avacyn, Angel of Hope" can also shield your units (and your commander) with indestructible, fortifying Marshal's benefit against removal. She may be the weakest of today's champions at only 2/1, but Loyal Apprentice is also the cheapest, needing only two mountain land's red mana. She also arrives with haste, letting her avoid summoning sickness and attack immediately, which can slip in an early two damage if your foe hasn't fielded any blockers yet. 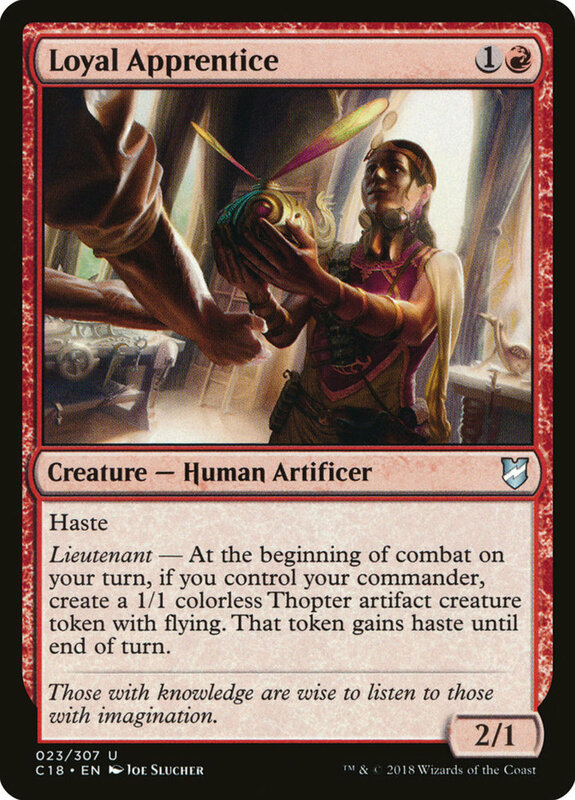 More than that, at the start of your combat phases where you control your commander, Apprentice happily crafts a colorless 1/1 thopter artifact creature token. Although they're weak, these tokens are surprisingly versatile. They come with flying, making them sweet air blockers, and they gain haste until the end of the turn they arrive (you only need haste for one turn anyway), allowing instant actions. Additionally, their thopter and artifact statuses strengthen the effects of certain type-dependent cards, so don't overlook these handy machines when building a red deck. Like Agonies, Loyal Guardian demands five mana for its entrance, although only one actually needs to stem from green forests, making it an easy fit into multicolor decks. This staunch ally bears a respectable 4/4 and trample, letting any excess combat damage against blockers pierce through to hit your opponent. Additionally, at the start of battle phases with your leader fielded, Guardian places a +1/+1 counter on all creatures you control! Counting itself and your commander, this means you should be getting at least two counters every turn and quite possibly more, a sizable bonus that permanently boosts your army (they'll keep the counters even if Guardian or your leader dies). 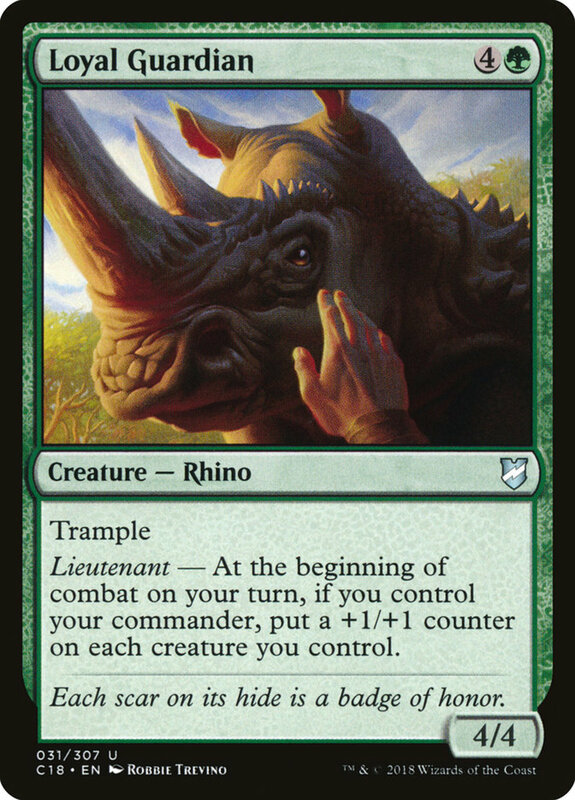 This rhino's a decent unit even without its lieutenant trait, and in conjunction with its boss, it wields a lasting and formidable supporting bonus. This ocean-dwelling beast will also demand five mana to play, but it helpfully arrives with five power and five toughness. It also enjoys hexproof, preventing your opponent from targeting Kraken with any effects (while you're still free to do so). 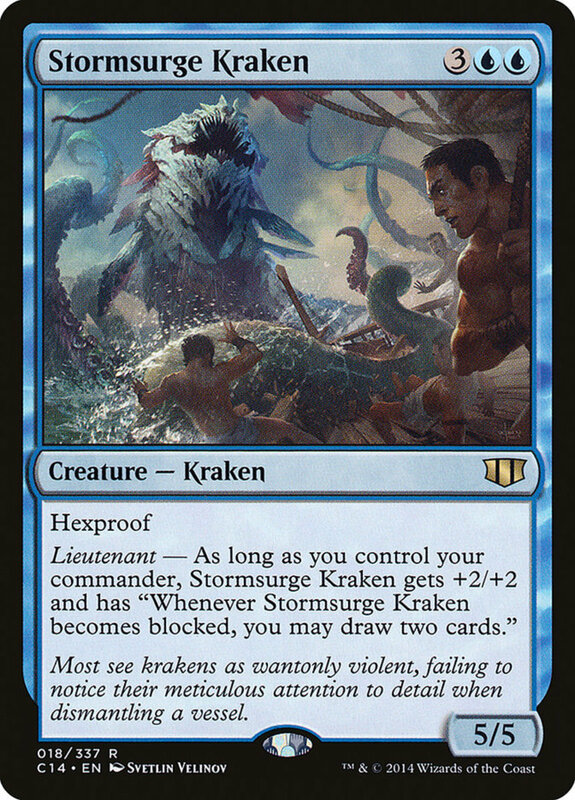 Beyond that, with your commander out, Kraken gains an additional +2/+2, becoming a daunting 7/7, and lets you draw two cards whenever it becomes blocked. Overall, Kraken's a strong and resistant ally whose effectiveness is less dependent on its secondary abilities than most lieutenants. Also, unlike Loyal Drake's mandatory draw, Kraken's hand-replenishing is optional, so in the rare cases where you wouldn't want to use it (perhaps against mill decks), you can choose not to activate the trait. While it's the most mana-taxing of today's corporals, Tyrant's Familiar compensates with several great latent powers. Although 5/5 is only decent for its price, this dragon arrives with both flying and haste, acting immediately and soaring past land units. 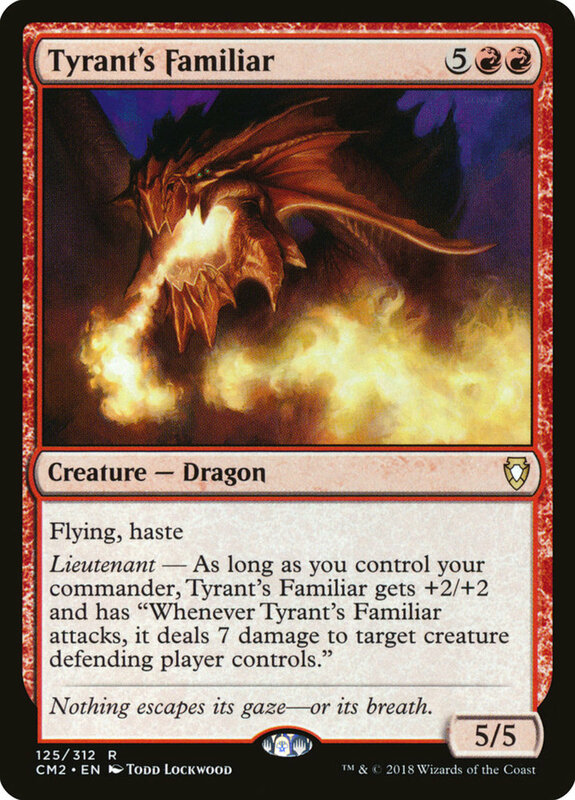 Even better, while you control your commander, Familiar gets +2/+2 and deals seven damage to an opposing unit whenever it attacks! 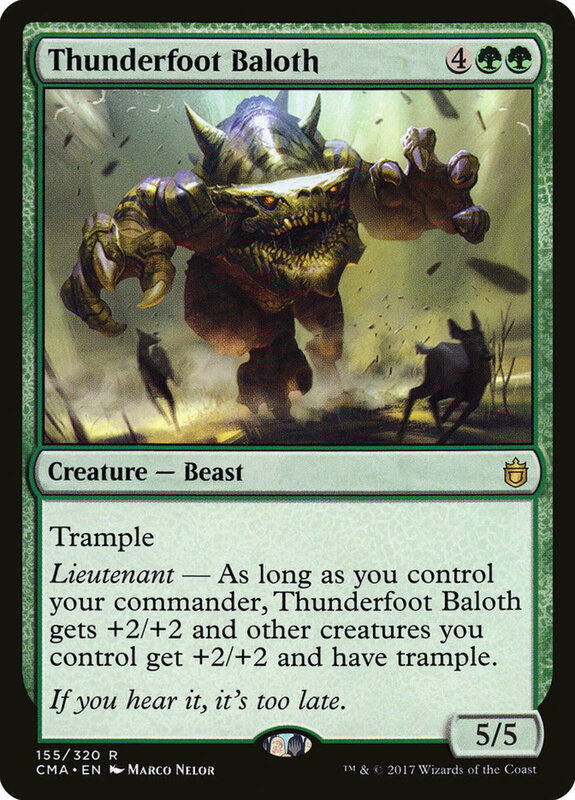 As the second-most expensive card today, Thunderfoot Baloth can still hit the field midgame thanks to green's impressive mana ramp capabilities, or you could avoid its cost with spells like "Defense of the Heart" and "Norwood Priestess". Regardless of your casting method, this beast enters as a 5/5 with trample. However, as long as you control your commander, both Baloth and your other units gain +2/+2! Unlike Loyal Guardian, this won't give permanent counters (meaning everyone's buff will crumble if Baloth gets killed), but it's an immediate and fierce increase for your team. Not only that, Baloth offers your units trample, ensuring everyone can land some hurt to your opponent even if blocked. 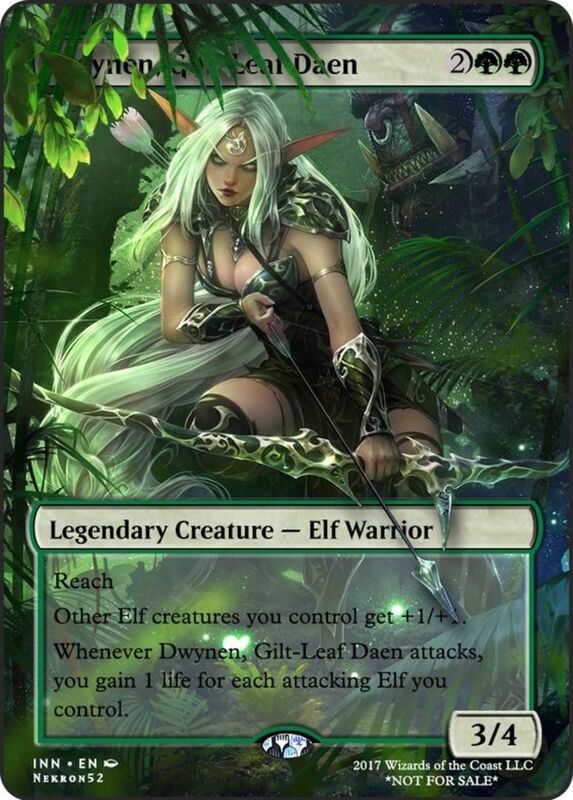 A formidable monster, Baloth makes a superb ally for popular green commanders like "Omnath, Locus of Mana". 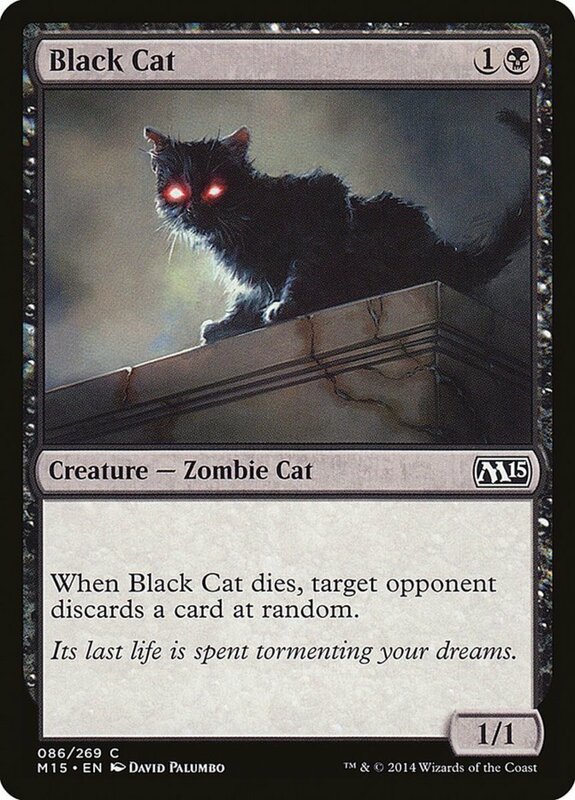 For a moderate cost, this mystical creature enters as a solid 3/4 with vigilance, making it a dependable attacker who can still block on your opponent's turn. However, as long as you control your captain, Unicorn bestows your entire army with two spectacular effects. 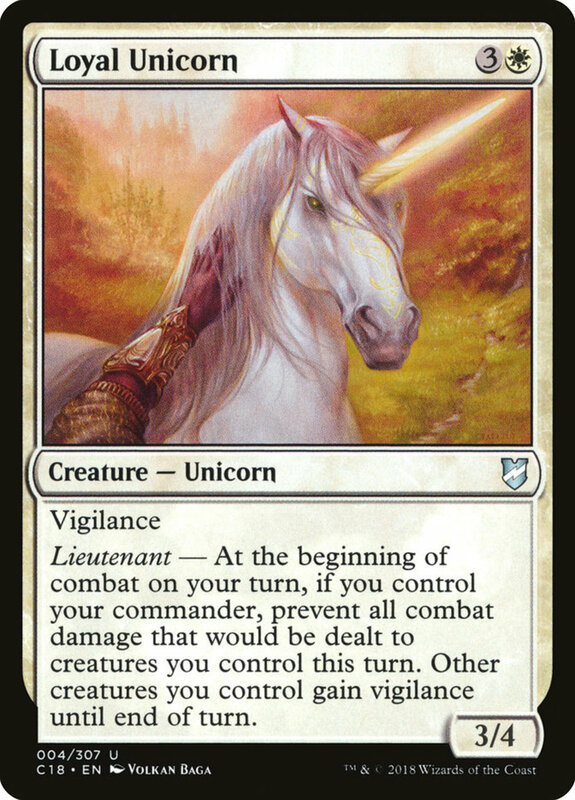 With your commander out, at the start of combat on your turn, Unicorn gives your creatures vigilance until the end of the turn (they don't really need it on your opponent's round anyway) and renders your entire squad (including itself) immune to combat damage for the rest of the turn! With vigilance and protection in combat, you're free to swing with everything you've got; not only will no one tap, they'll be completely barricaded against your opponent's blockers. What else can I say? Loyal Unicorn is decent on its own but absolutely lethal in tangent with your general. 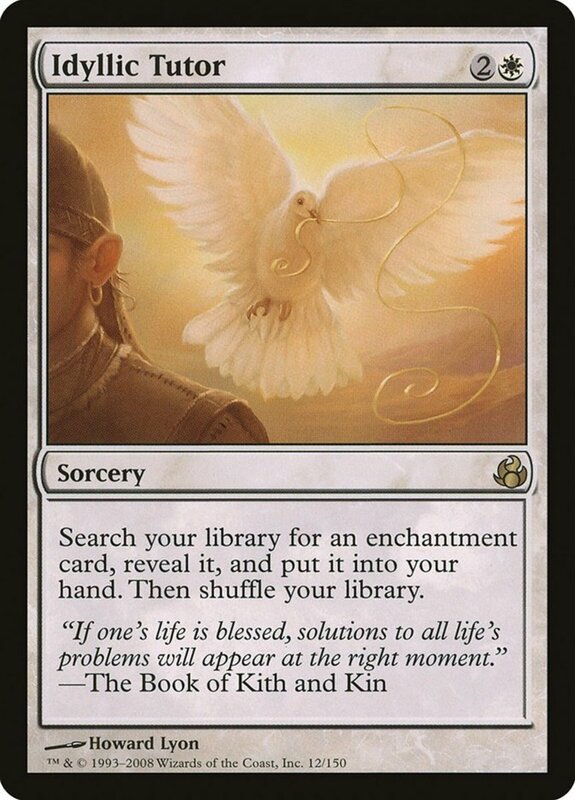 I've used it in several of my own EDH white decks, and I definitely recommend snagging a copy while it's still cheap, costing less than two dollars! We've seen the awesome powers these second-in-commands will grant your armies; remember to use defensive measures like "Mother of Runes" to shield your commander from harm, as your lieutenants will lag until you can recast them. The gods make good leaders due to their indestructible nature, partner commanders give two chances for maintaining the bonuses (staying active in case one falls), and simple low-cost generals like "Sram, Senior Edificer" can be quickly recast if defeated. Sturdy units in any EDH decks, lieutenants often grant field-wide techniques to bolster your whole unit, almost like combining a creature and enchantment into one potent package. 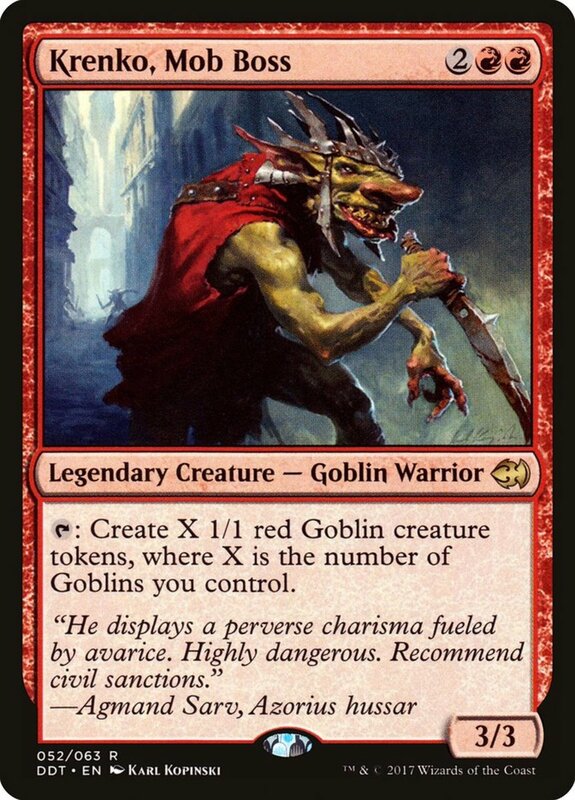 But for now, as we eagerly await Wizards of the Coast's next expansion of commander-supporting combatants, vote for your favorite creature and I'll see you at our next MTG countdown!